There has been a massive adoption of IoT application development in past few years and 2018 has been the revolutionary one in terms of IoT platforms acceptance, data revolution and acknowledgment of key IoT security challenges. Gartner study of 2017 predictions stated that as, there will be 11 million connected things across consumers vertical, cross industry business, and domain specific business verticals. 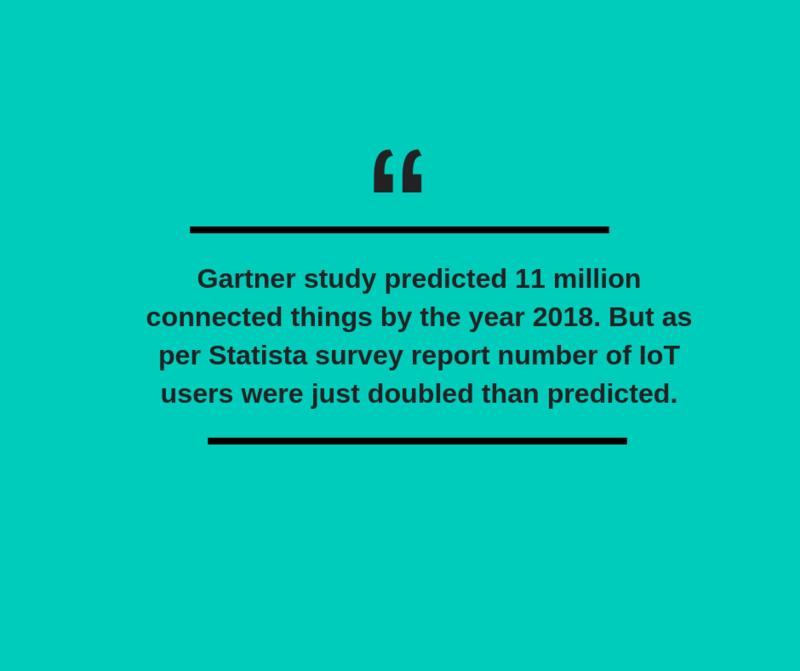 However, Statista survey report claims that the number of IoT users were just doubled than predicted. This clearly dictates the acceptance among users and industries. The importance of IoT is being realised by the individuals and industries right from the evolving IoT business models, especially in the areas of smart cities, 5G, edge & cloud computing, virtual and augmented reality, governance and democratization. Previous year witnessed big tech giants like Microsoft building IoT application development incubators that would work for security solutions for IoT enabled applications involving huge consumer data. For example, 2018 presented IoT connected biotechnology delivering targeted treatment round the clock along with automated medication. From introduction to inception, the IoT technology has grown tremendously and gained a lot of attention from people all around the world. Keeping in account the developments happening in the IoT industry in 2018, below are some interesting applications of IoT for the year. Since Internet of Things involves multiple devices to work in sync together, security is always at risk. 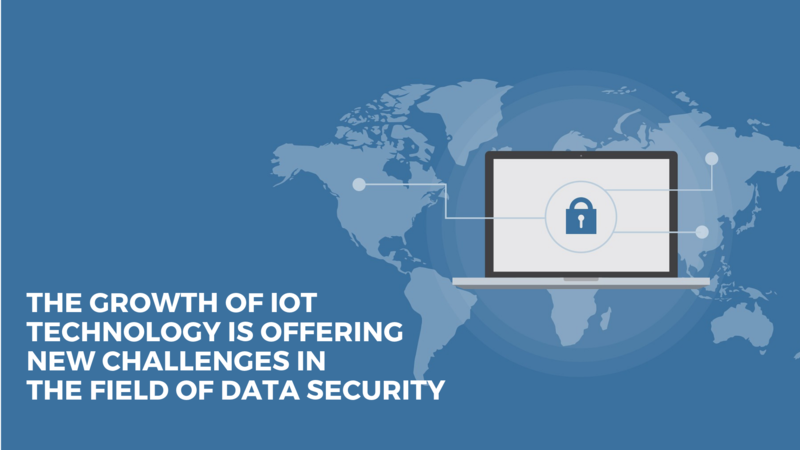 Till date, security challenges are still the main obstacle in the entire IoT ecosystem. Security remains the biggest issue across the entire IoT ecosystem. We live in a world where system connectivity is a crucial part of engaging and improving growth of the overall systems. However, this very crucial part leads to a high amount of security breaches thus, putting data at high risk. Authentication methods like biometric ID for mobiles etc is popular these days and connected devices can be expected to be benefited through this. For instance, virtual assistants like Alexa are being developed to detect and recognise multiple voices which leads to exclusive access over different interconnected devices via IoT. Another security issue in the field of IoT rises when it comes to customer-oriented security tools. Several companies working on a solution for this suggest to use encryption techniques similar to that of banks so that the security problem is resolved. However, researchers and IoT engineers are yet to figure out one solid solution for resolving security concerns of IoT devices that consists of smart homes and cities in order to increase the adoption of this technology further. Security of data collected via IoT devices is extremely important as this data is susceptible to vulnerabilities if it falls in the wrong hands. Interconnected IoT systems control hold large amount of valuable data from different products and services. But this data is in its raw format meaning that all the bulk data is not arranged in an organised manner so as to be used directly. Instead, these huge data sets need a lot of decluttering in order to gain valuable insights which leads to an extra work according to data scientists. Therefore, all the companies using IoT data as of now are not being benefitted as they should. Working in this direction, many new approaches are being developed which are expected to help organisations working in the field to utilise IoT data better. The growing scope of IoT application development shows strong potential in different areas and therefore, it is expected to increase the output of functions like industrial asset management, transportation management as well as government security. People are actively being involved with data and things in their day-to-day life which shows the promise of acceptance of smart cities too. This will result in major automation through sensors and service reliability majorly when it comes to public safety and environment protection. Data obtained through IoT sensors can help in creating optimised security patterns to avoid or take care of natural or environmental hazards in a better way. Since IoT runs on the basic principle of connecting different devices together, it has to be connected to different technologies too. IoT applications often integrate the abilities of machine learning, image recognition etc. Newer technologies like blockchain are also a part of the game as systems integrated with both IoT and Blockchain are also being created now a days. One of the most famous example of a successful IoT application is predictive maintenance which comes into being by the sole integration of ML with IoT. These technologies when synced with IoT can bring an array of extraordinary possibilities together. Working in this direction in the year 2018 can bring up new innovative applications that can create smart-data and increase automation. As per The Forrester Wave, IoT has allowed operations professionals to understand the upcoming valuable opportunities. 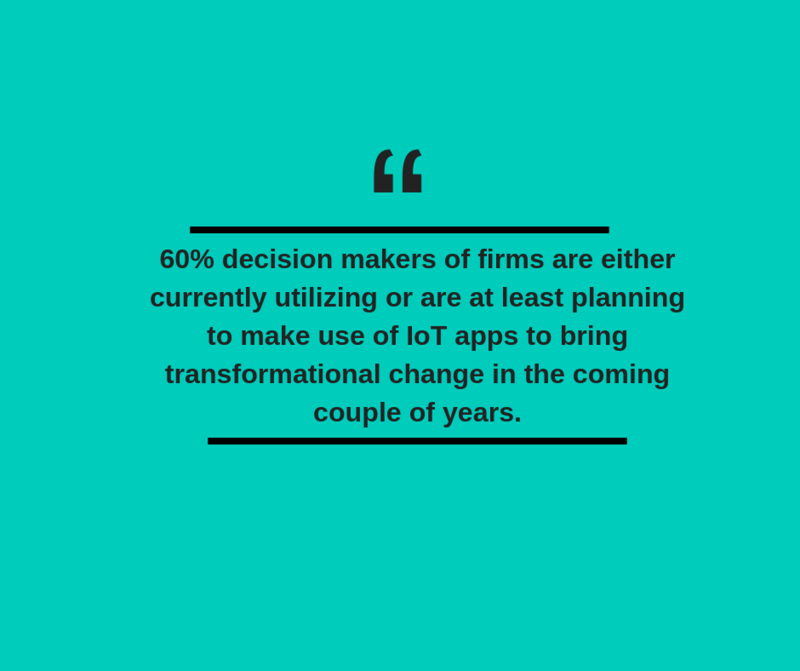 According to their research, almost 60% decision makers of firms are either currently utilizing or are at least planning to make use of IoT apps to bring transformational change in the coming couple of years. However, in order to scale the adoption of IoT at its peak, it is important that different hardware and software systems work in sync as one unit rather than scattered solutions. The disintegration between these parts make IoT adoption challenging. In the year 2018, wide-scale adoption of IoT platforms are being worked on in order to take care of systems security, management and analytics. Analytics are the basic building blocks of the IoT application development. 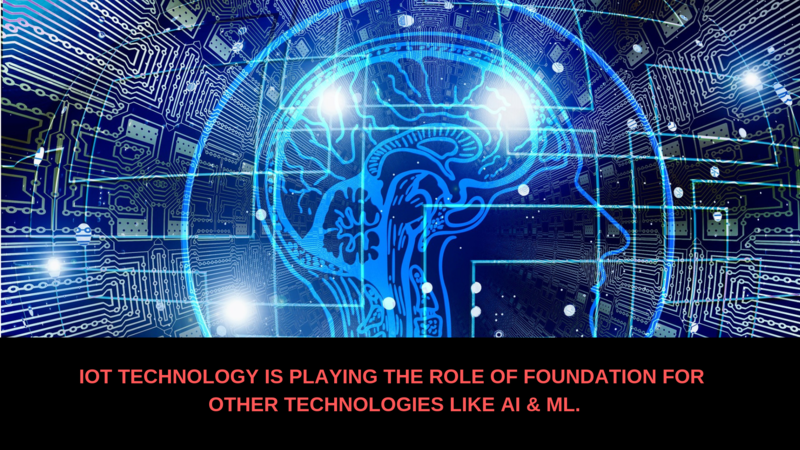 Companies and organisations are investing their money on building digital infrastructure as of now but soon the picture will change and more money will be put up in increasing digital literacy. Industrial IoT is working towards making the most out of analytical capabilities. This has led to a growth in employment numbers for data scientists, researchers and data engineers. Technology giants such as Google, Amazon and Microsoft are investing funds in new experiments related to developing next-gen analytical tools. The boom of IoT is resulting in ground breaking manufacturing standards. Smart factories are being worked upon to face the challenges of the next generation and stand firm in the upcoming industrial revolution. Early adopters of the IoT technology have already seen the good side of the IoT technology as the equipment downtime has been reduced dramatically along with better consumption of energy. An estimated number of 50 billion devices are connected and in circulation in the current date. In the future, this number is more likely to increase. With more devices, the usage of applications of cognitive AI and predictive analysis will transform the picture of how things work today. Smart home technology is a trend that might not of interest to the old generation but the young and millennials are surely intrigued by it. IoT powered smart home devices are charming and highly popular in the year 2018 and this trend will continue to follow as the technology becomes more efficient and reliable with time. Smart home devices provide security and progressive approach towards a lifestyle as they are highly intuitive and innovative. These devices can also prevent or inform you in the case of emergency situations like fire in your home. With people’s lives getting busier with each growing day, such devices can be hugely helpful and popular in the near future. IoT devices mostly depend on cloud for storing the data but now researchers and developers are finding better ways of utilizing and computing this data through edge computing. Meaning that the data would be initially transferred on a local device rather than the cloud and this device would be responsible for sorting and filtering the data. Once this data is organised, it’ll be sent to be stored on the cloud. This approach has multiple advantages as it allows management of huge datasets and low dependency on cloud all together. In the coming months, the usage of edge technology will become more popular as it facilitates better security while decreasing the connectivity costs. The healthcare industry is made up of a lot of different elements and therefore, the scope of IoT application is huge in this industry. 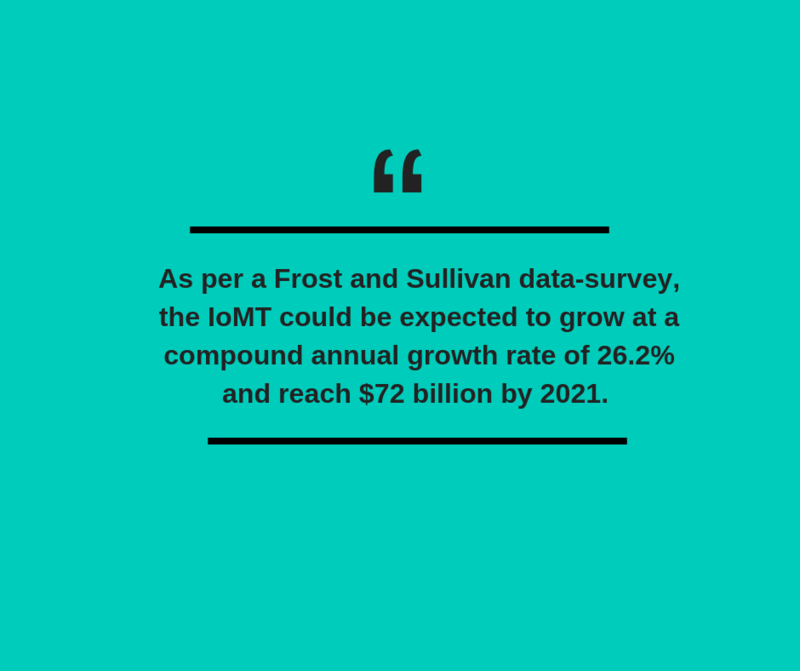 As per a Frost and Sullivan data-survey, the IoMT could be expected to grow at a compound annual growth rate of 26.2% and reach $72 billion by 2021. Different devices facilitating healthcare such as sensors, wearables, medical monitors etc. are expected to be connected and function in an IoT based ecosystem. Today’s generation is more tech-friendly than ever and thus, the adoption of IoT based technology will be welcomed in the medical industry. mHealth apps and patient monitoring home care systems along with IoT can help improve the overall health of the patients and lead the medical world in the better positive direction. Startups and enterprises are both looking for interesting applications that could bring the desired change in their businesses. The ever growing tech industry is working on finding the true potential of Internet of Things and how it will deal with the current issues prevailing in different domains. Data-driven decisions, predictive analysis, and proactive replenishment will drive the future of an IoT based economy. How IoT Application Development is Changing Various Industries →← What is IIOT – All About Industrial Internet of Things.